Easter, Ēostre, Ostara, or simply put, the Spring Equinox, is one of my favorite times of the year. I grew up in Michigan and Canada where we have fields of Tulips, Daffodils, and Black-Eyed Susans that fill the view as the snow melted away. Metaphorically speaking, it's that time of year where everything gives way to the old and in with the new. The beginning of Spring marks a perfect time on your calendar to start a new project, explore a new idea, learn a skill, or even have a wedding! That's why I was so excited about this Easter brunch inspired wedding. In order to celebrate the naturalistic side of spring, the wedding was hosted on a local ranch: The Davie Ranch! As I pulled together our team, including Lara Rose Photography to capture the day, one of the most important parts of the reception for me was that it was placed on an open field, snug with one of their beautiful oak trees. The mix of the rustic Davie Ranch with the chic softness of Elements and Accent's tables was bound to be natural and sophisticated at the same time. The benefit of having an outdoor wedding reception on their farm is the variety of visitors we ended up getting in our shots! We had peacocks, chickens, and even some baby cows walk by as if on cue. An important factor of a nature-inspired spring wedding is the flowers. Our floral designer, Julia Rohde Designs, provided us with an array of flowing greenery, garden roses, lavender sprigs, and peonies. We decided to stick with a lavender, blush and ivory color palette to compliment the blush wedding dress provided by LA Boudoir and to fit with the spring theme. Instead of a 3-course meal set up, we decided to go with a gold and porcelain brunch look with teacups to compliment it, provided by the Mix Dish. Every holiday has its traditions. Some people roast a ham or duck for Easter, others may incorporate a grand breakfast spread. 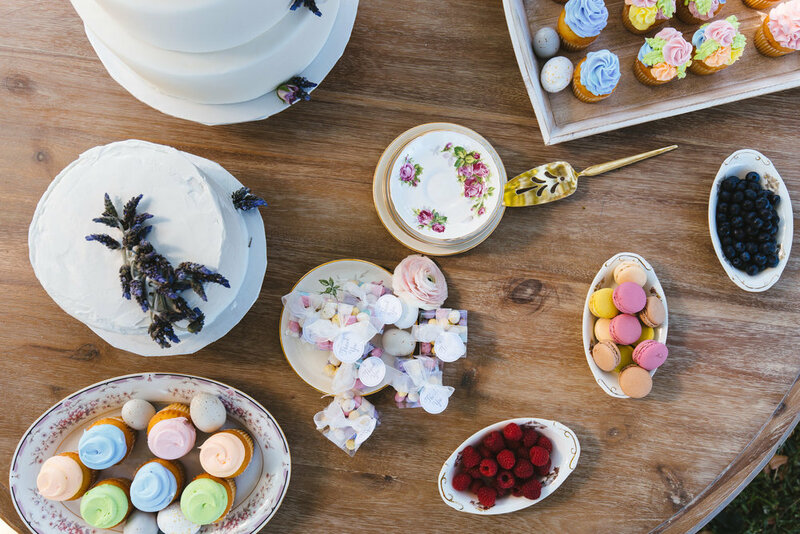 We had our caterer, the Culinary Republic, create a beautiful spread of cakes, macaroons, and cupcakes. Altogether, it made for an absolutely beautiful morning of everything you could want for a reception. Another guest at our table was a baby bunny who couldn't have tied in the theme any better. After the reception, the bride had a horse that Julia Rohde created a neck collar for. 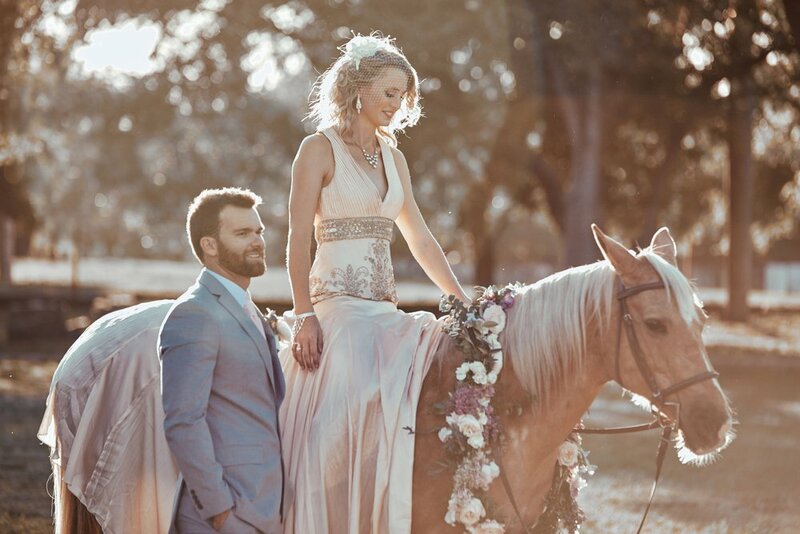 There is something very romantic about a groom carrying away his bride on horseback. No matter how you spend your holiday weekend, we hope that you have happy beginnings this year! For more photos, be sure to check out the whole gallery here.